I have posted draw-and-tell stories before, but this is the first time I've ever written one! It's not terribly original, but I hope you like it anyway. I had fun experimenting with this form, and I hope to come up with more in the future! Tina loved to eat treats! For her birthday, her grandfather gave her a silver dollar to buy any treat she wanted. It looked like this. Tina walked down to the store to pick out a treat. At the store, she walked around and around looking at all the things she wanted. Finally she saw a long counter full of her favorite treat! It looked like this. Tina walked back and forth looking at all of the choices. Then she picked one! After she paid, with her silver dollar, she headed back home, eating her treat the whole walk. Do you know what Tina’s favorite treat is? 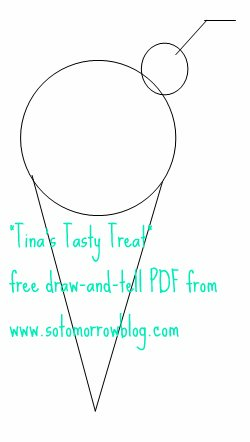 You can download Tina's Tasty Treat complete with drawing instructions(PDF). Please share this widely if you wish, but don't edit it to remove my name or blog address. Let me know what you think! Mollie is hosting the roundup today! I love Draw-and-tells and so do my storytime kids! Thanks for sharing. I love this so much! I am intimidated by the draw and tell format, but I am going to work up the nerve to share this one at one of my preschool story times. And yay for ice cream themed flannel Friday posts!